This 2-hour program is produced & hosted by Mark Manning. The show plays with themes, questions, special events and features New & Local Releases, glam, indie, punk, funk, folk, classic country, jazz, electronic, and live in-studio performances from area bands, performers and writers. Past shows have included these special guests: The Grisly Hand, Lily Tomlin, Greg Brown, Chris Haghirian, Dollar Fox, Marty Kraft, Stacy Tolbert, Anne Winter, Frank Alvarez, Linda & Richard Rostenberg, Iris DeMent, Robert Moore, Billy Smith, David Ford, Coleen Voeks, Chuck Haddix, Tim Finn, Necia Gamby, CJ Janovy, Tim Kearns, Kurt von Schlemmer, Lisa Cordes, Matt Dunehoo, Brian Hicks, Nico Gray, Sandra K. Davies, Cris Williamson, Gary Krough, Virgil Rhames, Donnie L. Betts, Jack Cole, Sam Cordes, Scott Cordes, Cathy Barnett, Kate Clinton, Jason Ryberg, Matt Erickson, Sunshine Del Hamric, Zoe LaGrece, Mark Hennessy, Ed Tato, Bill Sundahl, Cody Wyoming, Aaron Barnhart, Nate Borofsky, Tom Livesay, Suzanne Westenhoefer, Thomas Frank, Dana Gilmore, Regina Spektor, Ubaka Hill, Cynthia Levin, Emily Lauren, Jon “Piggy” Cupit, Tim Brown, Robert Brand, Julie Lee, Susie Keynes, Will Leathem, Tabla Rasa, David Sokolowski, David Wayne Reed, Rosie Flores, Jeff Black, Steven Eubank, Justin Van Pelt, Charlie King & Karen Brandow, Toby Grotz, Stephan Said, Crissy Sciolaro, Robert McCain, Missy Koonce, Abigail Henderson, Christi Hoffman, Tret Fure, Ira Harritt, John Jessup, Cheryl Kimmi, Tom Crane, Frank Hicks, Bob Bond, Miriam Davidson, Rebekah Presson Mosby, Paul Malinowski, Megan Hamilton, Dan Barnett, Pete Dulin, Pam Taylor, Peggy Friesen, Art McDonnell, Amy Boyd, Joel Kraft, Piney Gir, Mica Thomas, Jade Osborne, Connie Dover, Richard Pirodsky, Bess Wallerstein, Lora McDonald, Lew Edmister, Daniel Dermiztel, Rev. Sam Mann, Lisa Valenti, Emily Tummons, Mike Murphy, Vicki Walker, Beth Marshall, Nathan Granner, Beau Bledsoe, Mark von Schlemmer, Maria Vasquez Boyd, Cory Call, Brady Karlin, Megan Birdsall, Griffen Alexander, Sabrina Matthews, Bob Smith, Alexis Barclay, Steve Sachen, Ellen Sheridan D.D.S., Rick Dodderidge, Karen Errington, Joe Baehr, Joyce Slater, Tim Miller, Steve Brown, James MacDonald, Elizabeth Rich, Dorothy Hawkins, Debra Mellicker, Richard Mabion, Charles S. McVey, Jamie Rich, Tom Edmonson, Durwin Rice, Shawn Pavey, Paolo Andino, Ike Sheldon, Betse Ellis, Jerry Harrington, Sunshine Patten, John Koop, Corrie Van Ausdal, Barclay Martin, Erin McGrane, Mark Lowrey, Rick Willoughby, Giuliano Mingucci, Michael Buckley, Terry Hancock, Chato Villalobos, Uzziel Pecina, Hector Casanova, Robert Heishman, Lonita Cook, Joe Faus, Rocky Hopson, Rob Houle, Agustin Frederic, Chris Gibson, Ron Simonian, Sarah Anderson, Steph Allen, Flora Chang, Mimi Mangrum, Christian Hankel, Jeff Freling, Kyle Dalquist, William Belzer, Jenny Mendez, Gilberto Guerrero, Robert Coleman Trussell, Howard Iceberg, Janet Brown Moss, Natasha Derakhshanian, Elizabeth Hawn, Mike Ryan, Kathy Hale, Samantha Silveira, Art Suskin, Kathy Kane, Vi Tran, Matthew Griggs, Shane Evans, Lou Jane Temple, Chadwick Brooks, Mark Wingard, Jim “The Blind Guy” Hoschek, Philip blue owl Hooser, Tom Lancaster, Scott Easterday, Marco Pascolini, Richard Burgess, Sam Platt, Gnarly Dan, Justin Norcross, Elaine McMilian, Spencer Brown, Ron Megee, Dewey Chafee, Damon Lee Patterson, Johnny Hamil, Mike Stover, Kent Burnham, Jane Gotch, Rev. Paul Smith, Mark Southerland, Jori Sackin, Pat Vamos, Jim Hightower, Eleni Mandell, Jill Sobule, and Tommy Ramone. 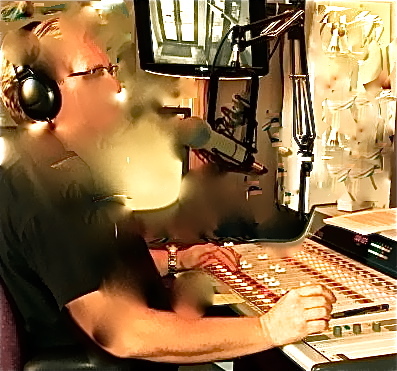 KKFI is a 100,000 watt, Non-Commercial, Independent, Community Radio Station, celebrating 23 years on the air.